Procreate is a particularly popular app to use when it comes to hand lettering. In addition to a ton of great free and paid calligraphy pens, you can also use the app to fill your letters with color, images, and more. Once you have your writing on a layer the way you want it, you can jazz it up with color. You can use Procreate’s masking feature to fill the lettering with blended colors, photos, and more. After you’ve completed your lettering, open the Layers tool and tap the layer with your lettering and in the flyout menu tap Select. Tap the thumbnail again and this time tap, Mask. Open the layers panel and create a new layer. This is the layer where you’ll add your color. 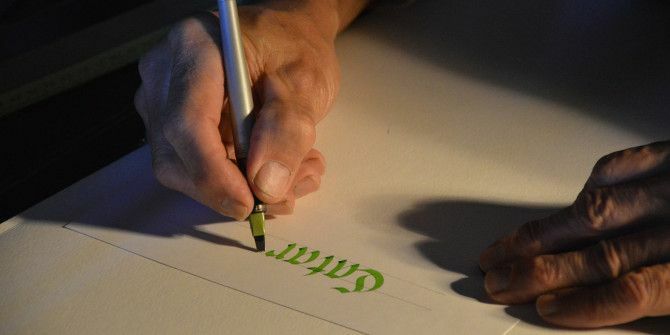 As you add your color, you’ll see that it’s restricted only to the area of your lettering. You can add just one color if you’d like, but a popular method is to use rainbow coloring and creating a watercolor effect. If you’ve got harsh lines and want your colors to blend, tap the Adjustments tool in the top left menu and tap Motion Blur. Drag the slider to the right to blend the colors. Around 15 to 20 percent should be sufficient. If you find Motion Blur doesn’t create the effect you’re looking for, you can try Gaussian Blur instead. Go back to the Layers panel and turn off the black lettering layer. Select the photo saved to your iPad that you want to use. Open the Layers panel again and tap the thumbnail of your lettering and tap Select. Open the layers panel and tap the thumbnail of the texture or colored layer and tap Clear. Your lettering should now be filled with your photo, texture, or coloring. If you’re looking to up your hand-lettering game using Procreate, don’t forget that you can install Procreate brushes available for download How to Install Brushes in Procreate How to Install Brushes in Procreate Procreate is one of the most popular designer apps to add to your arsenal. Here's how to install custom brushes in Procreate. Read More from hand-lettering experts around the web. Explore more about: Digital Art, Procreate.